As I mentioned before, we are now the proud owners of an apple tree! I have no idea what variety is it, but I’m so excited to be able to get an abundance of free organic apples to use for fall preserving. 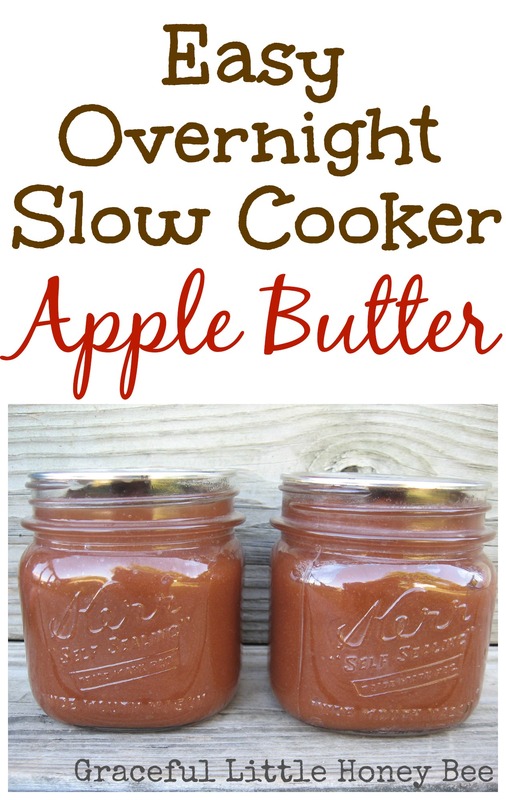 I’ve shared this slow cooker apple butter recipe before, but thought it would be nice to post again since apple season is upon us. 2. Put apples and vanilla in slow cooker. Set on low for 8 hours. I left it overnight. 3. Mash apples and mix in cinnamon and sugars. Continue cooking another 6 hours. Process in blender for a smooth consistency. Should make about 6 pints. Using USDA safe canning practices, process in water bath canner for 10 minutes or store in the refrigerator for 2-3 weeks. Put apple slices in slow cooker with vanilla. Mash apples. Add cinnamon and sugars. I filled a 6 qt slow cooker but only got 3 pints and a small jelly jar out of it! How did you get so much more? I used approx. 8 lbs of apples. Maybe my slow cooker is larger.